A new start for a new year. This was my hope. I believed that we would be together, cancer free and moving up toward our new life as a family. So now I am stuck. I can't get past the days when she was declared NED by her doctors at children's. I can't get past the ill advice that we received from them about treating her in the last month, and I can't get past the miscommunication that happened throughout her treatment after her surgery. What's the worst is the guilt I feel for not being more clear minded when we were trying to switch protocols. Two things stick out in my mind that I feel would have kept her alive. The first was when she was having her bone marrow biopsy at children's after her induction therapy was done. Mike asked if they could do the four site biopsy in preparation for going to sloan. They advised no, but said we could if we really wanted to. I said no. If I had said yes, we could have possibly avoided the second biopsy, or could have known earlier and asked better questions when we were at sloan. The second is when we found out about her second biopsy from Sloan. I still felt that antibody would have been the key to clearing her bone marrow for good, and when I asked about the protocol for refractory/residual disease, I was told "we like to make sure it's resistant." If I had simply asked "is she qualified as of now," we would have gotten a different answer (as she was technically qualified), and we could have had a choice to do or not do the chemo. What makes me the most mad and frustrated is that doctors make you beg, plead, and argue with them to get more information than "well, that's not the normal thing to do." They are the ones we look to to for answers, for suggestions, for new ideas. We bring them information that we have found to find out if our child qualifies, and rather than giving us the straight answer, they bog it down with "well everyone else does this." I thought peer pressure was supposed to be done after high school! She was our child; we had to make decisions that were right for her, not because everyone else was doing it. We were in the right place, and making the right decisions, and her doctors were pushing against us forcing us into treatment we didn't want and didn't feel was right for her. How can they do that to families?! My baby should have been here now. She should have gotten the treatment we wanted her to get. She should have been accepted the first time we asked. This is traumatic for a parent to go through. No one wants to hear bad news, and doctors should not be making a traumatized parent repeat themselves multiple times in order to do as they wish. We were bullied by her doctors into doing treatment that we didn't want, and weren't informed that she was qualified for the treatment we did want. Their "agenda" caused my baby her life. And now, my biggest fear, is that they are still doing it to other families. I again am so sorry for your loss....she was an angel...! You need to stop banging your head thinking what if...what if.....I have read through you blogs and posts since the diagnosis and i have to say they Dr.'s and Staff were doing the right things. You see Neuroblastoma is not a very well known Cancer and hopefully through the years they can be more educated and find better treatments or better yet a cure... My cousin spent almost 2 years in and out of hospitals and thank god his daughter who was then 2 at the time and is now 9 has been in remission for 5 years this past November. Some of the kids we met while at the hospital were not so lucky, the cancer spread way to fast. I know right now it seems the pain will never go away but in time knowing she is pain free and with the angels up above. It is frustrating and I have no idea what it is like to lose a child, I lost the next best person, my mother recently. Doctors do not give us the best advice or the same advice they would if their children were struck with such a disease. Doctors are evasive & do whatever case management tells them to do. It is sad & pathetic but I would challenge anyone who says differently. I wish doctors would step up & treat, instead of pussyfooting around the issues! I think it is normal to go through feel guilty after the loss, I beat myself up when my mom passed. There is no comparison I suppose. The laws of nature say we are supposed to bury our parents, not the other way around. My heart is with you & when I read your blog about the doctors, something in me became angry, because you are right. "My baby should have been here now." You are right; she should be here. I don't know what to say. My heart hurts deeply for you and Mike. What I want to say would probably cause you more anger and frustration right now, so I won't say it, but I'll pray it for you both. Kezia, I hear the agony, regret and guilt in your voice. These are the emotions of someone who is struggling to explain an explainable loss. I am so sorry for your sadness. I am in pediatric healthcare and I agree with you that doctors do have agendas. There is often more than one right answer and more than one right way to treat a patient and the choice of which path will be recommended is too often influenced by outside sources such as enrolling patients into study groups or hospital protocols or any number of administrative hurdles that have very little to do with sick children. I keep this quote from Atul Gawande, MD, MPH on my desk. This is from an article that he wrote about quality in health care for The New Yorker in December, 2004. "If the bell curve is a fact, then so is the reality that most doctors are going to be average. There's no shame in being one of them, right? "Except, of course, there is...When the states are our lives and the lives of our children, we expect averageness to be resisted. And so I push to make myself the best. If I'm not the best already, I believe wholeheartedly that I will be. And you expect that of me, too. Whatever the next round of numbers may say." Oh that every doctor could battle the pull of averageness and become the best that their patients deserve. You were certainly the best mom that your daughter deserved. Well Anonymous, obviously you haven't lost a child or had to deal with doctors and their fear of lawsuits. Yes, they do want what is best for their patients, but they have a healthy fear of lawsuits and they know what insurance companies will and will not pay for. Kezia, turn your anger into doing something positive. Fight girl. Fight for what is right and good and healthy. You are a good person, a good mommy. You will always second and third guess your decisions. You made the best decision under the cicumstances and the information given you. Even if she had not gone, you would still be looking for other ways to save her, better ways, because you're her mother. You will always be her mother. Just because she isn't here, she is in your heart, so she is always with you, no matter what. Kezia, I'm so sorry for your loss. It is a painful thing to lose a child. Doctors don't always get it right but I think that the larger issue is that not enough is known about this cancer and that is the real problem. I want to say don't beat yourself up over this. You did the best you could and I believe hind sight is always 20/20. Doing something different may or may not have changed the end results and you don't want to hold onto all that negative energy thinking about the what ifs. Focus on the good and the huge positive impact your daughter has had on the world. She touched more people in her short life than most people will do their lifetimes. Our family continues to pray for you and Mike. She absolutely should be here now. Please do not blame yourselves though. You did what your heart told you to at the time. There is no way to know if different treatment would have worked differently. Please don't beat yourself up over it now, she would not want that for you. These feelings are part of the process of losing someone that you loved more than yourself. You and Mike did everything right! You made the best decisions that you could with the information that you had at the time. I think of you guys every day and always hope that each day is better than the last. Though you would change things in a heart beat if you could don't beat yourself up over the what if's. Everything you did, you did with hope and love for Saoirse and that is always the right thing. I can't agree with you more. My aunt passed away almost three years ago from a very long awful battle with cancer. I remember many of my family members and myself feeling just as you do. Doctors are not all in cahoots with one another. Like you have mentioned before with the internet and facebook, why are they not all working with one another to accomplish curing cancer? A big one is that my aunt's doctor was strictly chemo and radiation. He never even suggested anything else, when there is so much out there that could have been done in addition to her treatments, the nutrition piece, B-12 injections etc. If there was one place with everything to offer to fight cancer. I feel like people would have a better chance surviving. Then maybe my aunt would still be here and so would your daughter. I almost feel like this relates to the movie Extreme measures. Have you seen it? It is okay to be angry!!!!!!!! You and Mike tried your best. However, from personal experience Doctors are not always right or do the best for thier patients. Sorry if this upsets people but my sister died way to young because doctors did not want to listen. Take your anger for your loss and turn it in to a positive. God bless you both. I am so sorry how you feel....... I will pray for you... I am praying for you every day! Kezia and Mike, I want you to know that my heart and mind is always with you. Always. I am another NB Mommy here, and as we fight the fight with my daughter and I read what you write here, I agree. Doctors are not always in cohorts with each other, each of them say something different, and the what if's are always going to be there. We have them now, and Emily is still fighting. I just wish I could hug you right now, because you are a wonderful mommy and Mike is a wonderful Daddy and the motion that you are going through are so normal. Sending you love from the Hubbel Family! Please read another blogger's site: rockstarronan. This is another mother blogging about her son, Ronan, dieing from the same cancer. Her name is Maya Thompson. 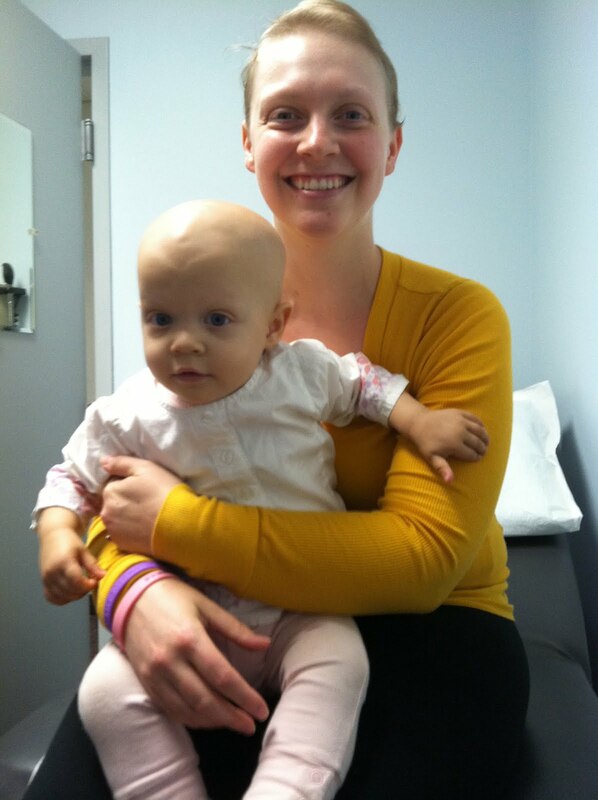 She is really trying hard to bring light and awareness to childhood cancer, esp. this form. She has some stars supporting her in bringing awareness, like Bret Micheals. She is also on fb. She is trying to get more funding for research for cures, and bring to light how little is known of this diesease even after all these years. I hope it helps. My family prays for yours and hers, and all families going through this. And I hold my 5 children extra tight and give them extra hugs and kisses remembering those mothers who are unable to. God bless you both. Doctors are "tools" we use to manage our healthcare. They do not advise based on anything other than being sued. You use the medical profession to manage your own healthcare. They do NOT care about you or your family, they only care about walking the fine line of avoiding law suits. Once you get this, you will be better able to make the correct decisions for yourself and your own illness. NEVER rely on them. I understand your guilt, and your questions. We went through some of that after our Alexander died (also NB) It is hard to live in this "cancer world". There is so much out there - and so many choices. However, we don't always know what is out there. When we went for a second opinion for our son, in some ways we WANTED them to say the same thing - because then we didn't have to "choose" one hospital over another. You made the best choices that you could with what you were given. You were wonderful parents that loved your beautiful girl! One day - one moment at a time. I agree with what others are saying about doctors, and other things. It is all almost true. Please don't blame on yourself for what had happened. It is not good. Both of you had done that you both thought, might help. It is normal that parents feel being blamed or guilt that their child is not getting better. But, it is not true and no one is to be blamed at. It is important to think the good memories that you two had with her. Sending healing thoughts/prayer. I want to agree with Nancy the cookie gal completely. You did the best you could in this environment. You advocated for your daughter as well as anyone could. I think you will use what you've learned to save some lives. The price for this knowledge is TOO HIGH, and I wish you still had Saoirse instead of this knowledge provided by hindsight. Please don't blame yourself. You did the best you could do. I can feel your anger and I understand the pain you feel because of it. Saorise should be here now with you and Mike running around with Fallon. From reading your blog and Mike's, I know that you two have what it takes to really make a difference in children's lives. Use your anger to develop a parents' advocacy group like you had mentioned before. When I sit here and reflect on what you are going through and I put myself in the situation, I think that it would be so informative and helpful to have someone with you to ask the questions you can't think of. I know you will help other children and their parents. I am sure you already have. You are bringing awareness to this awful disease. I know that is not what you want. You just want your sweet baby girl and nothing will change that. She was truly beautiful and will always be beautiful. Thank you for sharing your inner most feelings with everyone. Someone to blame or what happened to you. But I can tell you that doctors have no hidden agenda and they do fight for your child as they would do for their own. It is just as frustrating for them to see a patient suffer due to lack of sufficient knowledge and good medicines as it was for you. I know this because I'm one of them. You do not see them cry and you do not see them angry because theLy do this at home with their families or at work with their colleagues or during tortuing themselves with running marathons or some other distraction that helps them keep going despite witnessing pain almost daily. Cancer affects doctors the same way as everyone else, they are also regular people, and even doctors and their children die of cancer if it's an uncurable type. Nmyc amplified neuroblastoma with certain mutations is 100% lethal. 100%. No child survives longterm. This is what we have to fight and focus all our efforts on, so it can be changed. If there were medicines to cure Saoirse, she would have gotten them. Wow, clearly some polarized thoughts here. But two things are clear. 1. Saoirse should be here right now. 2. Kezia, you are STRONG and your horrific experience, knowledge and awareness will help future families. I am inspired by you to live better and stronger. Kezia, You loved your child with all your heart and soul and you fought for her every minute of her life. Don't torture yourself with second quesses. Now you are at another crossroads. Do you allow the anger you feel to make you bitter or do you use it as a positive force, another tribute to your child and other children suffering from this devil's desease? From reading your blogs I think I know which course you will take. I know you are angry with the doctors you dealt with, but I know that armed with knowledge from the experiences you went through with your child (and your singular determination), you can find excellent doctors who could be persuaded to help you develop a protocol for parents who are trying to make decisions for their child's treatment. It is a huge undertaking but if anyone can do it you can. May God be with you. I feel so terrible that you are struggling so much with this aspect. You are wonderful parents who did absolutely everything in your power to save your child. Of course when you look back on terrible things you have the hindsight and feel like you should have known, but you probably couldn't have known. She had a horrible horrible disease that took a horrible course. And it is terrible and we will never know or understand why this happens to such wonderful people. Needing to cast blame seems obvious, but I worry that it is a dangerous path of your energies. I believe doctors want to do everything in their power to save lives, especially the lives of children. From what I have heard her doctors were often in contact with each other and did try to choose what they thought was the best course of treatment. Of course, they are also human, and can be wrong. We'll never know if the other course of treatment would have saved her. Her disease was horrible, it's the disease that killed her, not the people. Of course you are angry, however I hope you can find moments of peace in her happy memories, and be able to advocate for other families without righting off doctors completely, but more learning how to talk with doctors and ask the right questions to bring up the subjects needed to keep doctors and parents on the same page. I don't know who you are, I've never met you or your daughter. But I feel like I knew her from your blogs and your pictures and your stories. And when I read that she had passed, I cried. I didn't just shed a tear or 2, but I sobbed. I sobbed because no mother should ever lose a child, I sobbed because no child should ever have to get cancer (2 things that I will be quizzing God about when I get there!). It's not fair. I don't know why you were picked to fight this fight. And yes, your daughter should be with you. It's only natural to think that... Keep writing. Keep putting your feelings, your thoughts, your soul out there. Because you and your daughter have deeply touched my life and touched the life of my kids. Who would also come over to see pictures and to hear how your baby girl was doing...empathy is alive in this country even though our media wants us to believe it is not. Doctors are in over their heads with cancer. It is just impossible to know everything about it when it can mutate and change as much as it does! Yes, your baby could still be here if you had made a different decision. But she would probably still would be fighting the fight of her life and really that is no way to live. As horrible and as sad as that makes me, her cancer was fierce. There is no way to be able to say it would have ended any differently with a different treatment plan. After 8 months, she is now pain free. Your baby girl is finally pain free! And even the heavenly angels are no replacement for your mother. She'll be waiting for you to hold her again. And you will....She'll also come visit you. I 100% believe that she will come visit you in another form or in another child. You will see glimpse of your daughter, maybe it'll be another cancer strinken child that you help. But you will see her and you will feel her and she will be so proud of you. LOVE YOU with all of my heart. You and your family are on my mind constantly. Kezia, I really hope you and Mike find peace and stop questioning your part in her death. You DID FAR MORE THAN MOST PEOPLE WOULD THINK TO DO to advocate for Saorise!!!! I totally identify with your anger. Doctor's are human and many I have dealt with over the years (with my elderly parents) have been very humble and helpful. However, their are just as many arrogan know-it-alls out there that won't listen to anything. Furthermore, not telling you what ALL OF SAOIRSE'S options were (EVERYTHING SHE IS ELIGABLE FOR) is lying by omission. I'm not commenting to point fingers. I just wanted to say again that I too am completely OUTRAGED that you're beautiful baby is not here. The system HAS TO BE CHANGED! I am so, so sorry. I've had breast cancer, and ever since then I've worried about the different illnesses I've experienced. Is the cancer coming back? Has it spread? So many doctors just DO NOT listen, and Marcus Welby and Dr. House are not real, unfortunately. I've known great regret in my life. I hope someday you can forgive yourself. I know your daughter already has. Be well. I am so very sorry to hear about the loss of you little girl. I lost my son almost 2 years ago and it is still extremely difficult to understand and bear. I highly recommend you read the book "A Broken Heart Still Beats" when you feel up to it. It has become a lifeline for me and helped me to find words for all the emotions involved in losing a child. My thoughts are with you and your husband. I have been following your blogs for so e time, grew up in Danvers. my heart breaks for you, recently having my first child, and I am a nurse. My prayers are with you and your husband through this difficult time. You are an amazing women and mom . So sorry for your heart ache, I truly hope as days pass your pain will cease. I have no doubt that you are going to make changes in healthcare, you are an inspiration. With deepest sympathy. Don't torture yourself. It is a rare disease, knowledge is poor, very poor. Doctors also agonize before abd after they talk to you. For they know the limitations. This can be a horrible world if we allow the anger to take over. Resist. She should still be here Kezia. We (not you and Mike) are all to blame. Everyone who ever had the chance to hear/learn about this disease, become involved, do something. But did nothing. Or did so much less than we should have done. Apathy, not wanting to see it because its so sad, not knowing where to start, thinking that one person can't really change anything, thinking that a lack of doing something won't REALLY make a difference in whether or not change comes. All of these are so 'easy'. And culpable. All of these excuses are the reason that change has not come yet and that innocent sweet little angels like Saoirse still go through this. And that their families have to go through such unimaginable torment and loss. We, who have ever made the choice (and it is a choice) to NOT do something, not TRY to do something and do or try again are responsible. And that has made it easier for Doctors to make the 'mistakes' (yes, they are mistakes) that Kezia outlines here. I don't agree with the previous post. At all. Kezia, be angry if you are angry. You've got more reason than anyone, than most will ever have. I hope you can vent, without direction as needed but ultimately find a place to direct it, chanel it...for change. Anger, passion, personal loss...these are things that drive people to not stop until change is realized. You're broken, but you're so strong. Allow yourself whatever you need when you need it. Feel what you feel when you feel it taking you over. Get through this however you need to, to get to where you need to be. I keep trying to leave you both comments, but anything I have to say falls short to even my own eyes/ears. I just cannot bear to even imagine the pain you are in. our daughters are so close in age (close in proximity too). i honestly cannot bear to think of it. and i can only imagine that the sorrow i feel for you and your families cannot begin to touch the pain you are in. I guess if there were one thing I could convey to you both, because I am seeing it on both your blogs, please try to stop second-guessing yourselves. I know that it's natural to go through this, and I know that you know this. But logic and rationale have nothing to do with loss. Especially the loss of your baby. So, while I imagine it's way too early and perhaps you are not in a place to accept it yet...please consider that hindsight is perceptually 20/20. There are too many variables and uknowns. And, I understand what you are saying and thinking. Perhaps you might have extended your time, but i'm not sure any other choices would have given you a different outcome. Cancer is a wretched beast. I hate it. It has claimed too many that I love and care for. So, sure, perhaps a bit more time...but, only maybe. I just cannot agree that you could have made any different decisions in the moments you had to make them. Please do not put that on yourselves. You absolutely have a right to be angry. And I was not there to see what was going on or hear what was being said by doctors, so I cannot agree one way or the other if they were guiding you best based on what they would do vs. what was safe for them to tell you (i get that), but in no way should you two feel that you didn't do your absolute best and most. ever. Your baby and your story has touched so many. It was such a high price to pay for such awareness, but of one thing I am certain...it will make a difference. I see so many others determined to make a change. So many checking in on you, when it would be much easier to avert their eyes, not click, and and try not to think about it. Instead, the other day as I stared at the advert on the T about the 10yr anniversary of Avon walk for breast cancer, and I realized how little awareness there is for the babies and how much more needs to be done. i have only just started reading your blog, but this post struck me as it is similar to a lot of blogs I have read from parents whose children have Neuroblastoma. It seems that particularly with this cancer, parents are very much left in the dark about different treatments that are available to them and ultimately the doctors leave it all in the hands of the parents rather than saying "here are the treatments available. We recommend this one.." Instead, parents are left with the choice and therefore are left with the consequences of that choice. I'm not going to tell you to stop second guessing yourself, as you are going to do it anyway - it is only natural. But I will say that you made the right call for your child - any decision you made was the right one. It is the doctors and the medical profession that are letting these kids down with their lack of research. The lack of funding has also let these kids down. I had never heard of neuroblastoma before 2011, when I started reading www.rockstarronan.com. Now I see it popping up all over the place - it is about awareness and that awareness doesn't seem to be getting out there. But together, all the parents and their supporters can get neuroblastoma out there and find a cure. I'm not sure if you have ever been to rockstarronan.com but Maya Thompson is a big advocator for raising awareness. She would also be a wonderful person for you to talk to because she has been where you are...she IS where you are.